The Hulme Arch Bridge is a unique looking bridge located in Hulme, Manchester. The bridge supports Stretford Road as it passes over Princess Road. It is also part of the regeneration plans for the Hulme district of Manchester. It re-establishes the former route of Stretford Road as well as providing a local landmark. In 1969, Stretford Road was divided into two halves with the construction of the Princess Road. Initially, a footbridge was constructed that crosses Princess Road in the same place where the missing half of Stretford Road previously ran. Eventually, plans were made to reconnect the two sections of the road to re-establish the old route. Design for the planned bridge was conducted by way of a two-stage, closed design competition which was commissioned by the Manchester City Council and the Hulme Regeneration Ltd. The first stage of the competition was held in March 1995 and came up with six entries. The winning entry came from the architects of Chris Wilkinson Architects. Reference for the winning design was the Gateway Arch in St. Louis, Missiouri in the USA, which was designed by Eero Saarinen. Construction of the bridge began on May 1996. Work was completed by April 1997. The bridge was formally opened in May 10, 1997. The Hulme Arch Bridge is distinguishable by its huge arch that spans diagonally across Stratford Road. The arch supports the bridge deck which spans 50 meters or 160 feet. 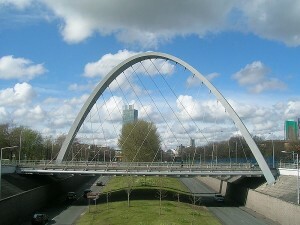 This span is held by twenty-two 55mm diameter spiral steel cables connected to the 25-meter or 82-feet high arch. The arch rests on a pair of concrete blocks which serves as the base for the structure and holds most of the bridge’s weight. In order to keep the arch in shape, the structure contains internal stiffeners and diaphragms, with the top section filled with concrete. To prevent internal rusting, the lower sections of the arch were coated with a vapor corrosion inhibitor. Removable covers were attached into the arch so that workers can get inside when there is a need to apply additional coats in the future. For its ingenious design, the Hulme Arch Bridge received several design awards, both as a structural wonder and as a notable landmark.